High atop Mount Veeder, we welcome you to Napa Valley. Whether you wish to enjoy beautifully crafted wine and food pairing from our culinary team, learn to blend wine , stroll through the Hess Family's awe-inspiring private art collection or take in the stunning panoramic mountain vineyard views aboard our high performance ATV- we have an experience tailored for you. A pioneer by nature, our winery founder Donald Hess was determined to defy convention and pursue wine making at elevation. In 1978, he established The Hess Collection Winery in a historic native stone building hewn by masons in 1903. The original stone structure is now joined by The Hess Art Collection, a world-class showcase of contemporary art. Considered by ARTnews Magazine to be one of the top 200 in the world. Passion, dedication and perseverance have been the guiding principles that have made The Hess Collection a world class brand and destination. As fifth generation Hess family, we continue to define the spirit behind the wines. We proudly continue Donald's legacy on tradition and his commitment to craft-world renown wines. Book any of our Elevated Experiences! Begin your experience with a guided tour through our historic Mount Veeder Visitor Center and Contemporary Art Museum. After which the Hess Collection Executive Chef Chad Hendrickson will present you with a farm-to-table three-course luncheon featuring menu items from the winery’s culinary gardens, paired with Hess Collection Napa Valley wines from estate vineyards on Mount Veeder. Lunch will be served in our private dining room with sweeping views of our Veeder Hills vineyards. Contact Events for more information. Your dining experience begins with a wine and hors d’oeuvres reception followed by a docent led tour through our historic Mount Veeder Visitor Center and Contemporary Art Museum. Hess Collection Executive Chef, Chad Hendrickson, will present you with a three-course dinner featuring seasonal, locally sourced, and produce from our organic culinary gardens. 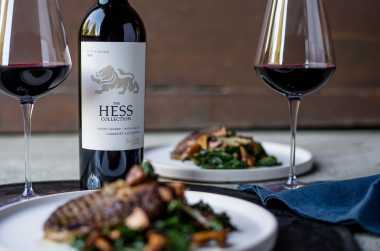 Dinner is paired with Hess Collection Napa Valley and Icon wines from estate vineyards on Mount Veeder. A guided tour of The Hess Collection Art Museum, featuring works from Donald Hess’ private collection, and pairing of three current release wines expertly matched with three exquisite creations from The Hess Collection’s Executive Chef, Chad Hendrickson. Begin with a guided tour of The Hess Collection, followed by a current release wine presentation paired with Artisan cheeses served with seasonal fruits and nuts selected by Hess Executive Chef Chad Hendrickson. Please allow 90 minutes for this tour and tasting experience. Daily at 3:30 pm, $75 per person. Following a guided tour of the Hess Collection, indulge in a current release wine tasting of four wines paired with artisan truffles developed and handcrafted in-house by our Pastry Chef, Linda Rodriguez. This is a unique and educational experience. Please allow 90 minutes for this tour and tasting experience. 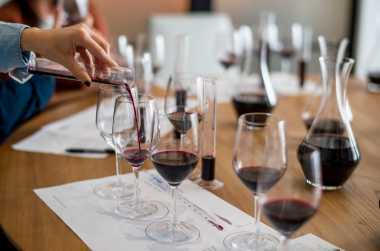 Wake up your senses and experiment with three varietals, learn their influence in winemaking and the art of blending . Then compare your blend with our signature Lion Tamer Red Blend. We welcome you to play winemaker for a day and take home your own custom blend. Following a brief tour with your dedicated host, delight in a guided tasting of special wines not found on our public tasting menu. The Hess Collection Collectors Club allows you to experience our winery on an elevated level. Each year, our winemaking team hand picks an array of wines that showcase the diversity and exceptional quality The Hess Collection has to offer. These wines are the foundation for The Hess Collectors Club. Membership also includes hand-crafted recipes, and VIP access to our Visitors Center and The Hess Collection Art Museum. Hess Winemaker Dave Guffy, believes great wine begins in the vineyard, working each vineyard block to absolutely maximize flavors. Learn more about The Hess Collection wines and winemaking from Dave’s winemaker notes, included in each club shipment. Chad Hendrickson, executive chef, utilizes local organically and sustainably grown products to create fresh seasonal recipes to pair with The Hess Collection wines. He pairs unique flavors and textures in each wine with complementary flavor combinations in the dishes he creates. Expertly pair your wines with one of Chad’s original recipes, also included in each club shipment. Donald Hess began collecting art in 1966. Today, The Hess Collection houses less than a quarter of a collection that is shown in museums worldwide. His collecting style is a personal endeavor driven by passion rather than monetary investment or current trends. He develops a close dialogue with an artist to better understand what drives him or her to create and he carefully limits his focus as a collector to 20 living artists whose work he faithfully supports long term. As is evident by the caliber of the collection, he collects with the uncanny ability to acquire works by lesser known artists who often go on to become well known and respected in their disciplines. His typical commitment to an artist spans decades and various stages of his career.